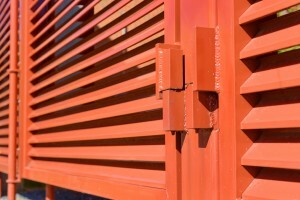 If you’re looking for a commercial fence, it’s important to look at all the options, including louvers. A commercial property without a commercial fence, is a commercial property that is constantly at risk. A commercial fence is extremely beneficial to a business, and should always be found on a piece of commercial property. But before you can go out and buy the first commercial fence you find, or the easiest to install, take into consideration a few things you might need in a commercial fence. After all, once your commercial fence is up, it will become a part of your property and a part of your business as a whole. Whether you choose louvers or a more traditional option, you do not want to make the wrong choice here. Chain link fences can easily get the job done, but they are not exactly easy on the eyes and pleasant to look at. When picking out a commercial fence, you need to take into consideration how it will look on your property. Your fence will be one of the first things people notice when they approach your property, and an aesthetically pleasing fence can leave a good first impression on those stopping by for the first time. If the outside of your business looks good, people will naturally assume all is equally as good on the inside and want to do business with you. The reason you are investing in a fence is not to add a something that looks pretty to your property, but looks do matter so if you are adding a fence, it is important to make sure that it is at least a good looking one at that. The job of a fence is to make sure your commercial property and business are safe from any intruders, robbers, or anyone else that may wish to harm your business in any shape or form. A fence’s ability to keep a property secure is what determines the fence’s capability, and whether it was a smart investment, or a total waste. You will need a fence that is difficult to get past. One that is difficult to climb and impossible to jump over, thus preventing people from easily trespassing on your property. The fence you choose will need to be made out of the right materials, something that is strong, heavy and either difficult or near impossible to break. Privacy is also a factor to take into consideration when picking out a fence and thinking about security measures in its design. A fence that is difficult to see past or through will make sure that whatever happens past the fence is not known to any unwanted observers. If you’re ready to install or update to aluminum louvers, or to learn more about what an aluminum louver can do for your business, the professionals at Hercules Custom Louvers are ready to help. For more information and to learn how we can meet your custom louver needs, contact Hercules Custom Iron online or giving us a call at 1-800-331-2590. We will ensure your investment serves your family for years to come! For updates and to see projects we’re working on, visit us on Facebook, Twitter, LinkedIn, YouTube, Google+, and Pinterest. This entry was posted on Friday, May 11th, 2018	at 10:54 am	. You can follow any responses to this entry through the RSS 2.0 feed. Both comments and pings are currently closed.